With Wave, it seems that they can. I felt compelled to Tweet about them like a deranged fangirl. I found myself nodding in agreement when reading their About Us page. Waiting for my bank transactions was a pleasure because they've made a delightful little "Wave Pong" animation to entertain impatient people like me. The other Friday night, I allowed myself to go on to Wave and review my finances AS A TREAT. Heck, I even looked at my credit card balance. @WaveHQ Even waiting for my bank accounts to connect is a pleasure with the Wave Pong animation. Why can't all finance be this fun? Now, don't get me wrong, I love software and that's why I started The Wheel Exists. But honestly I'm not normally this into most platforms. I think maybe it's the one. "I didn't mind giving some space to promote a great product." Scroll down the comments and it's generally more of the same, a giant love up for FINANCE SOFTWARE. The world has gone mad. Obviously I needed to know more, so I caught up with Rob Maurin, VP of Brand Engagement at Wave to ask him some questions. Oooh, I could go on for hours. Wave is cloud-based software that helps run the money side of your small business. We started with accounting and invoicing, and have since expanded to payroll, receipt scanning and credit card processing. Our goal is to make it easier for the small business owner to run their business. In many cases that means taking away the pain, stress and distraction of things like bookkeeping by making those processes easy and fast. It also means offering most of Wave’s modules for free. And when we say free, we don’t mean “free trial” or “free ‘lite’ version.” We mean you get to use all of Wave’s accounting and invoicing features at no cost. Use it as much as you want; send as many invoices as you want to as many customers as you want; connect as many bank accounts as you want; for as long as you want; and there’s no charge for any of it. 2. How did Wave get started? Wave was launched by Kirk Simpson and James Lochrie in 2010. Between these co-founders they had experience both with digital online technologies, and with small business accounting. They had also been entrepreneurs at different stages of their careers, and knew first-hand how loathsome, confusing and time consuming bookkeeping and other administrative tasks can be for a small business owner. Small business owners have better things to do than try to figure out financial software, and then spend hours trying to get it to work each week. James and Kirk realized that there had to be a better way, and thought that they could see a solution in front of them: Reinvent the way accounting works for small business owners, create better tools, and put them all in the cloud. 3. What makes Wave different to other online finance options? For starters, we have a very clear definition of what it means to be a small business. We build Wave for the owners of businesses with 0-9 employees. That’s not to say that Wave isn’t used by bigger companies. We have many very happy customers whose size is well above 9 employees. 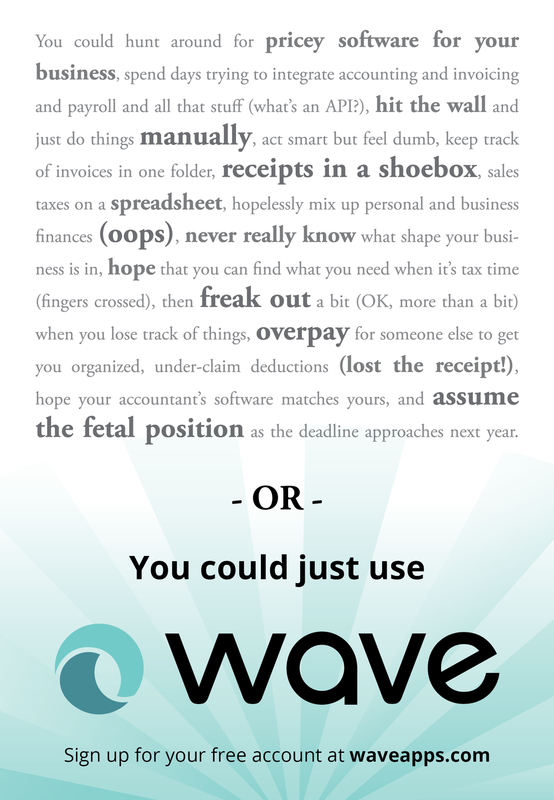 We use Wave ourselves to run our finances, and Wave has about 70 employees. But the point is: When a business has 9 employees or less (and that includes freelancers, solo entrepreneurs, consultants, contractors, etc. ), it’s the business owner who usually manages the finances day-to-day. So we built Wave for that reality. The business owner may not understand traditional accounting principles, and has no interest in going back to college just to learn them. Wave makes it possible to keep your books in order, at a professional caliber, even if you have no accounting training. All of these modules are 100% free to the user. There are small ads in the application, which we present very carefully with full privacy protections for our customers. On top of the free modules, Wave has some additional tools made specifically for the small business with 0-9 employees, and priced accordingly. One thing that is truly unique about Wave is that we also have a Personal Finance module built right in. Your accountant will tell you that you should do things like keep a business credit card that is entirely separate from your personal credit card. Same with your bank accounts. But that’s not the way many small businesses, freelancers, etc. work. The credit card they use to buy printer paper is the same card they’ll use to buy diapers for the baby. Or the account that they tap into to pay for the groceries is the same account that they’ll deposit their invoice payments into. This may not be how your accountant wants you to manage your money, but since it’s reality we’ve built Wave for that reality. Wave handles this kind of business/personal flow of money very elegantly, and correctly (from an accounting perspective) in the background. You don’t need to know a thing about what’s happening under the hood, and you can just live and work the way you do. Wave looks after the details. Also worth noting: Wave is real double-entry accounting. Many other cloud “accounting” tools are not really accounting. They are not double entry. They do not get you a Balance Sheet or allow Journal Entries or General Ledgers, and other technical stuff. The business owner doesn’t necessarily have to understand these components, but your accountant will insist on it! If it’s not double-entry, it’s not real accounting. If you ever want a loan, or have any assets to depreciate (like your computer), or you simply want to maximize your tax return, you’ll need a double entry system to do it right. 4. How can Wave help people save time and money? All of Wave’s modules and tools are seamlessly integrated. So rather than wasting time by using one application (or Microsoft Word) for issuing invoices, for example, and then transferring this info to an accounting application, everything happens in one place. Same with Payroll. Also, we’ve created time-saving tools like the automatic bank connection feature. Many business owners just stuff their receipts into a shoebox and figure they’ll get to it when they get to it. Eventually, there’s a mountain of receipts that need to be keyed in manually. With Wave’s bank connection feature, you can set up so that your transactions from your bank account and credit card get imported directly into your accounting records, so there’s nothing for you to key in manually. You’re always organized and you’ll never miss a deduction. Wave also has a free receipt scanning tool, including iPhone and Android apps. So let’s say you buy a client a coffee at Starbucks. In the 15 seconds you’re waiting for your order, you snap a photo of the receipt, which will upload directly into Wave. Now you don’t have to fuss with that receipt any further. 5. Who should use Wave? Anyone who will eventually have to file a tax return to the government for self-employed income or small business income should use Wave. It’s as powerful as traditional accounting software, a whole lot easier, and the core of Wave is totally free. 6. Is Wave better than an Excel spreadsheet? Absolutely! There are so many places where user error can creep into a spreadsheet. You can miss an expense, or enter it twice. You can key it in wrong. You can get a formula wrong. Using Wave lets you forget all that. Plus, Wave is backed up in the cloud, so even if your computer goes boom you’re still in business. And with the extra features like the mobile apps, and credit card processing, just to name two, there’s so much more you can do with Wave than even an expert Excel user could cobble together. Not to mention that if you have anything remotely tricky to account for, like loans or writing off your computer, I don’t even want to imagine what that spreadsheet would look like. Excel is a great program, but even Bill Gates wouldn't say it's an accounting solution. 7. Can you use Wave on mobile devices and tablets? Right now, Wave has iPhone and Android apps for receipt scanning, accepting cash or credit card payments, issuing receipts to your customers, and for running payroll. We’re aggressively pursuing our plans for even more robust mobile and tablet functionality in the future. Note: I literally am just a fan, there's no affiliate scheme or commission going on here.